Patrick Edgar Semphill F.M. "Tony" BROWNE. NOTE: He was shot down in the Battle of Britain and his son, Tony, was born post-humously. Link for Certificate from Commonwealth War Graves Commission: http://www.cwgc.org/cwgcinternet/certificate.aspx?casualty=1530678 . Patrick was a Flight Lieutenant in the Royal Air Force and served in the 229 Squadron. His memorial is on Panel 4 of the Runnymede Memorial in Surrey, England. Oonagh Ozra BROWNE NOTE: Through an email contact a couple of years ago, I connected with a friend of a man who was a step son of Oonagh’s. He wanted to get back in touch with Oonagh to let her know what an important person she had been in his life. He thought she might be in Copenhagen and was heading there to find her. I have not talked with him since. According to his friend's version, Oonagh had some eight husbands, one of whom was the father of the singer-songwriter - Paul Simon and was possibly the model for Mrs. Robinson in The Graduate. NOTE May 2004: A more recent family contact disputes this version and indicates that Oonagh had four husbands - three after the untimely death of her first husband, Bob Simon who died in 1967. This Simon was not the father of Paul Simon. Information from a news clipping: "By-election in Whitechapel" The Daily Telegraph. In December of 1910, Captain E.M. Browne ran as the Unionist candidate losing to S.M. Samuel by 540 votes (received 1,191 to the victors 1,731]. Browne ran against Samuel a second time in a by-election. I am guessing the year to be 1913 (the only year where a Monday falls on the 21st during months that Passover could begin). He was unanimously adopted as the Unionist candidate at "a specially convened meeting of the Whitechapel Conservative and Unionist Association in St. Paul's School Wellclose Square". The by_election seems to have been provoked by a decision of the Privy Council going against the incumbent, Samuel. This was an interesting riding. Apparently, at least one-third if not more of the voters were Jewish as was Sir Stewart Samuel. BROWNE looked to them for support in the hopes that they "would vote for the policy and not for the man", especially since it seemed that they were "absolutely antagonistic to the programme of the Liberal Party". He did not want the election to be fought on the basis of personalities "I attach no personal blame to Sir Stewart Samuel," he said, "and I hope the electorate will fight simply on the policy". His boyhood days were chiefly spent with his Uncle, the Rev. Hugh Edgar, M.A. from whom he received his preliminary training, which was continued under a well known Army coach in Dublin. He received his commission in 1898. ... lieutenant in the 1st Battalion Royal Irish Fusiliers and served throughout the South African War. ... After the declaration of peace he served for a year in Cape Town where he was appointed Captain on the staff, acting as D.A.A.G. for railway transport (Cape Colony)." "Captain Browne is a pronounced anti-Home Ruler and is much in demand as a speaker on behalf of the Unionist cause. He has travelled extensively throughout Europe, South Africa, part of Central Africa and South America. He is an all round sportsman and takes an active interest in boxing. In a news clipping "Whitechapel Guardians", debate centres around a letter which Browne sent to the Chairman asking for assistance in expediting the emigration of two men who wished to emigrate to Canada without delay and who were "reported upon favourably by the Canadian Emigration Officer and were deserving cases". The appeal was turned down as the committee felt that BROWNE might use their support to his own political advantage, "A prospective Parliamentary candidate might say 'See what I can do for the poor of the district.' If these people were deserving of emigration there were proper channels for the purpose, and it should not be done through a political candidate in the district." A clipping from the London Observer describes a presentation to Captain E. Monteagle BROWNE. A Mrs. Cohen, who was unable to attend sent her regrets and "paid her tribute to Captain Browne's cheerful personality and good fellowship". Obviously the by-election was a close race as Alderman Hodsoll "referred to the splendid work their late candidate performed in the division during the 2 1/2 years pointing out that in that time he had reduced a majority of 588 to 166". We the undersigned, on behalf of the Conservative and Unionist party in the Whitechapel Division of the Tower Hamlets ask your acceptance of this address, together with the accompanying album of signatures of subscribers as a small appreciation of the splendid work you have done for the party in the division during the last two and a half years as their candidate; and although twice unsuccessful, the position in which you leave the political conditions of the division speaks volumes for the hard and successful work you have done on our behalf as well as endearing yourself to all classes, irrespective of party or creed. 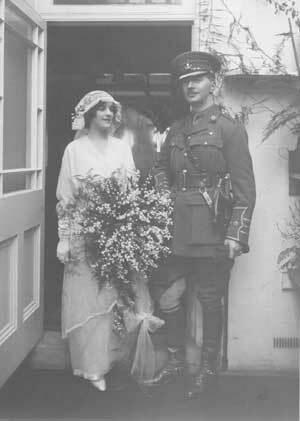 At the time of the wedding, Edgar was a Major serving as adjutant of the 10th Battalion of the Loyal North Lancashire Regiment. Before this, he was the Unionist candidate for Parliament for the Whitechapel Division as an advocate of universal Military service. He fought in the South African War and received the [Kings and Queens] medal with five clasps. After the brief honeymoon, the bridegroom had to return to the front. On May 24th, 1917, Colonel Monteagle-BROWNE of the Royal Munster Fusiliers was awarded a DSO for gallantry in the field. He had been 31 months at the front, had commanded with distinction three battalions and had been wounded four times. Several times he had been mentioned in military dispatches. He was first wounded in 1914 during the retreat from Mons (the retreat was from August 24th-September5th).. In another wartime news item he is described as Lieutenant-Colonel E. Monteagle-BROWNE commanding the 9th Royal Munster Fusiliers, one of four brothers in the service. He is described as an Ardglass man and that the family subsequently lived at Knock. The King of Montenegro also decorated him with the Order of Danilo. In peacetime he was known as "The Fighting Speaker". The men out in Flanders called him "The Fearless Leader of the Fighting Munsters". (Source: The Daily Sketch article, May 24th, 1917). During WWII, Edgar Monteagle BROWNE lived 66 Elm Park Garden of SW 10.